SIROCCO hails from Ireland, and “Lambay” is their brand new, third full length album. They classify themselves as "Celtic Heavy Metal." A little background on SIROCCO;Formed in 2003 as an instrumental band, until 2007 when bassist Ciaran O Cearuill took over vocal duties. He first sang on their second full length album “The March Through Crimson Frost”. Let me start off by saying I'm not familiar with any of the other albums by SIROCCO, so this will be new to my virgin SIROCCO ears. The most Folk / Celtic / PowerMetal I've listened to consists of FALCONER (an all-time favorite) and VEXILLUM. The album starts off with a really short but cool Instrumental called Azure, which transitions nicely into the first song. “Lambay” is a mid-paced song with some nice technical elements, so, things stay mid-paced with more catchy folksy riffs as the album progresses. I do have to say I hear some Progressive / Powerelements thru-out the entire album, if there is such a thing as Folk / Progressive / Power / Celtic Metal. Things really start to get better with “Fallow”; “Unearth”, followed by “MaelSuthain” a Progressive / Folksounding song that really starts to draw you into the album. Everything from here forward gets better, all the way to the stand out track (for me) “MaelSuthain”. Musically this is a very solid release with J. Tobin/ Padge Maderson taking care of the guitar duties, which are well done. I do have to say that Ciaran O Cearuill vocals are a bit weak, but don't in any way take away from a very solid release. I think anyone who is a fan of this genre would be pleased with this release from SIROCCO, nothing ground breaking, just a nice solid release. I know they've won me over. 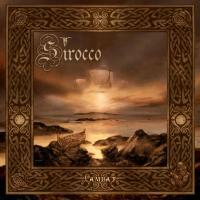 SIROCCO are an Irish band that define themselves as a Celtic Heavy Metal band. Those who have never listened to them certainly would be expecting to hear a lot of Folk / Celtic instruments, and typical folk sounds. However, SIROCCO succeeded in creating the Folk / Celtic effect through metal instruments only! The whole album is enjoyable, nothing boring in it at all. It is actually a concept album, and deals with historical facts about the “Lambay” isle and its invasion by the Vikings. What surprised me the most, besides the no-Celtic-instruments-thingy, is Ciaran O Cearuill's voice; it is very James Hetfield-like. His singing and the effects in tracks like “Lambay”immediately reminded me of METALLICA's "For Whom The Bell Tolls". The overall sound of SIROCCO is very old school Metal, and the riffs are very good and never repetitive nor boring. There's nothing extraordinary about SIROCCO's music though, yet still there's nothing wrong with it either. It is actually very good.